Saturday TV: Won’t You Be His Neighbor? 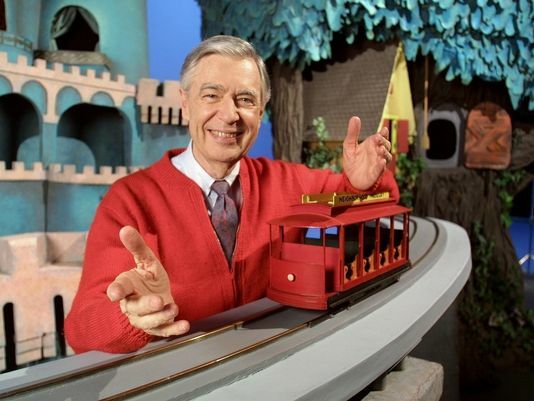 Last year’s top grossing documentary didn’t get an Oscar nomination, but it gets a double showcase tonight — both on premium cable and on public television from which he sprang, with the TV premiere of “Won’t You Be My Neighbor?” (HBO, PBS, 8 p.m.). It’s the story of Fred Rogers and his long running “Mister Rogers’ Neighborhood,” the kind of kindly live action kids show that simply doesn’t exist any more in a more fast-moving era of “Wild Kratts” (PBS, 10:30 a.m., check local listings), “Odd Squad” (PBS, 11 a.m., check local listings) and “Pokemon the Series” (Disney XD, 8 p.m.). “Planet Earth: Dynasties” (BBC America, 9 p.m.) looks at the painted wolf. Tonight’s Valentine’s Day themed movie “The Story of Us” (Hallmark, 8 p.m.), Maggie Lawson stars as a woman whose bookstore is threatened by a developer (Sam Page) with whom she’ll likely fall. The eight-team Alliance of American Football debuts with a Saturday night network showcase of San Diego at San Antonio (CBS, 8 p.m.). A more established league is also represented in primetime in the NBA matchup of Oklahoma City at Houston (ABC, 8:30 p.m.). “General Hospital”s Maurice Benard plays mobster John Gotti in the bio pic “Victoria Gotti: My Father’s Daughter” (Lifetime, 8 p.m.). Another mobster, Sammy “the Bull” Gravano, is subject of “I Lived with a Killer” (Reelz, 8 p.m.). And mobsters are an inspiration to a guy on “CopyCat Killers” (Reelz, 9 p.m.). On “Pit Bulls and Parolees” (Animal Planet, 9 p.m.), Villalobos goes to the Dog Bowl. A con man wanted in eight states is the subject of “Seduced by Evil” (Oxygen, 8 p.m.). The death of a college student could be related to “Smiley Face Killers: The Hunt for Justice” (Oxygen, 7 p.m.). A woman who thinks she was royalty in a past life wants a royal wedding on “Say Yes to the Dress” (TLC, 8 p.m.). “Love & Marriage: Huntsville” (OWN, 10 p.m.) has a wedding weekend in Miami. Turner Classic Movies has a couple of movies on race relations, “In the Heat of the Night” (8 p.m.) and “The Defiant Ones” (10 p.m.), followed by two films from 1980 that were up for “Nine to Five” (midnight) and “Honeysuckle Rose” (2 a.m.). Earlier, it’s all Oscar nominated biopics with “The Great Ziegfeld” (5 a.m.), “The Story of Louis Pasteur” (8 a.m.), “Young Mr. Lincoln” (9:30 a.m.), “The Stratton Story” (11:15 a.m.), “Yankee Doodle Dandy” (1:15 p.m.), “Calamity Jane” (3:30 p.m.) and “The Agony and the Ecstasy” (5:30 p.m.). Hockey has Pittsburgh at Tampa Bay (NHL, 7 p.m.). Men’s college basketball includes Wisconsin at Michigan (Fox, noon), Virginia Tech at Clemson (ESPN2, noon), Oklahoma State at Kansas (ESPN, noon), Providence at St. Johns (CBS Sports, noon), Temple at Tulsa (ESPNU, noon), Kentucky at Mississippi State (CBS, 1 p.m.), Minnesota at Michigan State (ESPN, 2 p.m.), TCU at Iowa State (ESPNU, 2 p.m.), Auburn at LSU (ESPN2, 2 p.m.), VCU at St. Bonaventure (CBS Sports, 2 p.m.), Villanova at Marquette (Fox, 2:30 p.m.), Florida at Tennessee (ESPN, 4 p.m.), Louisville at Florida State (ESPN2, 4 p.m.), Texas Tech at Oklahoma (ESPNU, 4 p.m.), Dayton at Rhode Island (CBS Sports, 4 p.m.), Utah at UCLA (Fox, 5 p.m.), Duke at Virginia (ESPN, 6 p.m.), New Mexico at Nevada (CBS Sports, 6 p.m.), Kansas State at Baylor (ESPN2, 6 p.m.), DePaul at Xavier (Fox Sports 1, 8 p.m.), Texas at West Virginia (ESPN2, 8 p.m.), Tulane at Wichita State (ESPNU, 8 p.m.), Creighton at Seton Hall (CBS Sports, 8 p.m.), Saint Mary’s at Gonzaga (ESPN2, 10 p.m.), Colorado at USC (ESPNU, 10 p.m.), Washington at Arizona State (ESPN, 10 p.m.) and UC Davis at UC Santa Barbara (ESPNU, midnight). Third round play is played in the Pebble Beach Pro-Am (Golf, 1 p.m.; CBS, 3 p.m.). Auto racing includes the Lucas Oil 200 (Fox Sports 1, 7 p.m.) and Pomona Internationals (Fox Sports, 1 p.m.) and Superiors Minneapolis (NBC Sports, 8 p.m.). Women’s college gymnastics has Minnesota at Nebraska (ESPNU, 6 p.m.). It’s men’s free skate (NBC Sports, 11 p.m.) in the Four Continents Championships. Major league rugby has Houston at San Diego (CBS Sports, 10 p.m.). Might be interesting to watch downhill ice-cross racing (Fox Sports 1, 10 p.m.), especially since it emanates from Boston’s Fenway Park. Highlights of the 17th Americana Honors & Awards ceremony from Nashville last fall are played on “Austin City Limits” (PBS, 11 p.m., check local listings), with Nathaniel Rateliff & the Night Sweats, Lukas Nelson & Promise of the Real, Fantastic Negrito, Brandi Carlile, Tyler Childers, Margo Price, I’m With Her, Buddy Guy, Roseanne Cash, Jason Isbell, k.d. lang, Irma Thomas and John Prine. Halsey is the rare host who is also musical guest on a new “Saturday Night Live” (NBC, 11:30 p.m.). A 2005 Tom Brady-hosted “SNL” with Beck is rerun at 10.